SAN LUIS OBISPO, CA (September 20, 2011) — It makes perfect sense that one of the most beautiful places (and the “happiest”) in America take steps to make its Inaugural San Luis Obispo Marathon, Half + 5K races on Earth Day 2012 (April 22) “green.” Runners and walkers who participate will enjoy a more eco-friendly race that, among other things, includes a commitment to 80% online registration of participants, using recycled or recyclable materials (tech t-shirts, bibs, paper), recycling at the SLO Life Expo (papers, plastics and shoes), using electric and hybrid vehicles on the race course and conducting education sessions for spectators and athletes on green initiatives at the SLO Life Expo. As part of its commitment to greater environmental stewardship, the San Luis Obispo Marathon + Half has taken the “Pledge of Sustainability” for its Inaugural event. 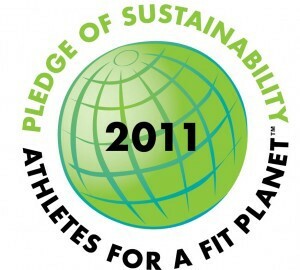 The pledge is administered by Athletes for a Fit Planet™, a leading environmental services company for athletic events. The San Luis Obispo Marathon + Half is displaying the Pledge of Sustainability logo on its website and FitPlanet is listing the San Luis Obispo Marathon + Half in its Green Events Calendar. The Calendar enables athletes to read all 14 eco-practices that the San Luis Obispo Marathon + Half has pledged to do at this year’s race. The San Luis Obispo Marathon, Half Marathon & 5K races take place on Earth Day April 22, 2012. The Marathon and Half Marathon races will benefit the Leukemia & Lymphoma Society and is a Team In Training event. The 5K race will benefit Special Olympics of San Luis Obispo. Race registration is now open online at Active.com. For further information on the Marathon, Half Marathon + 5K, as well as The SLO Life Expo and San Luis Obispo, please visit www.SLOMarathon.com. The San Luis Obispo Marathon, Half + 5K is a Get Off The Couch Potato Sports Production. Athletes for a Fit Planet is a leading provider of environmental services to organizers of athletic events, including running, multisport, cycling and walking events. FitPlanet’s Pledge of Sustainability and the Green Events Calendar allow event organizers to communicate their green practices to athletes, and allow athletes to make informed decisions about the events they participate in. For more information, please contact Bruce Rayner, Chief Green Office, at bruce@afitplanet.com, and visit FitPlanet at www.afitplanet.com.